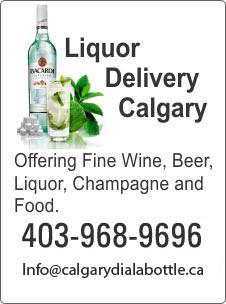 We deliver liquor and food city wide in Calgary. Delivery charges vary from one part of the city to other. We charge $9.99 for delivery in most parts of Calgary. Please call us to find out Alcohol delivery charges in your area. You can add additional stops at $2.99 per stop. We do not make mark up on liquor store prices. There is no product surcharge on orders up to first hundred dollar. Our customers just pay the price of alcohol at local liquor or beer store plus a delivery charge. There are no made up charges in alcohol delivery calgary services. You do not pay any regulatory fee, fuel surcharge or order processing fee. For gift orders only email orders@calgarydialabottle.ca or fill out the form on Contact Us page.